The Graves family let Thanckes house, because the second Lord Graves had been living at Bishops Court, Sowton, near Exeter and as Torpoint housing developed, the house was not secluded enough from the public. After the 4th Lord Graves revamped the house it was moved to Portwincke and in the press cutting that I have about the move, it states that the Ghost got left behind, who was a servant girl in the house and was murdered by the butler. Dang this board formatting! I've finally had time to take another look and saw your message (quoted above in this one) buried in the quotation of my post. Thank you, more interesting tidbits! At least I know that my ancestor wasn't the servant girl in question. Hi Rita, I'm calling dibs on behalf of my distant relation, who is the great-granddaughter of Richard Hoar who operated the Ivanhoe. I can't give you much info about your family tree (since I don't know where mine branches off from it), but I think that distant rellie of mine could. If you're interested, I could put you two in touch. She has done a load of research into the tree. Let me know if you have a family member who would be interested! Phil, I'm going to private message you. I have a YDNA match with the Hore family in question (how or when we don't know), and I would like to give the person in question a chance to get these items. She is in the US and I am in Canada, but hopefully something can be worked out! Might "Capt. Bob" have been an informal honorific? 1891, Robert Jago, born in Plymouth c1866, is a member of crew (stoker) on HMS Black Prince stationed in Devonport. He is also enumerated in Plymouth with his wife and parents-in-law, as a naval stoker. In 1901, his wife Elizabeth and children are in Plymouth. In 1911, he is Chief Stoker Pensioner, a caretaker, in Bath. If so, my guess as to the date is the one that was way off. Probably son of Samuel Jago and Agnes Braginton, born 1865 East Stonehouse. Terrymo, thank you for that offer and I think I will take you up on it when I figure out just which of mine were in St Stephens by Saltash when! Meanwhile, this thread spurred me on to delve a little more into "my" Jago(e)s in Ontario, more stuff being available on line all the time, and I discovered that one of mine was once a local mayor. Still haven't figured out where they came from ... but it's interesting that he was married to someone with a fairly unusual surname that was the name of my ancestors from St Cleer. And turns out it was a different Jago married to the woman with what I'd thought was my St Cleer ancestors' surname, but no, duh, it was my Kent ancestors' surname (they're similar ...), but she was from the unrelated Lancashire branch. I think I'll stick to my own tree for a while! Funny this should pop up. A few days before the last activity in this thread, October 2013, I closed the deal on a new house in a new city, and we moved here in early 2014. The house isn't actually new -- circa 1880 to be exact -- and an elderly neighbour told me it was known as "the old Jagoe house". Mrs. Jagoe died here about 25 years ago, after living here from childhood (around 1905) with her mother and stepfather. Mr. Jagoe is the man she married and then stayed on in the house with to raise their family, nearly 80 years in the house altogether. I've been trying to figure out where the family of Mr. Jagoe (birth reg as Jago in the mid-1890s in Canada) originated. His father (and his father's mother) show in censuses as born in Canada, but since I can't find his father's father's birth or marriage, or find him in a census, I'm stymied for the moment. I wonder how many John Jago(e)s were born in how many places 1830-1850ish. Anyway just amusing, who knows, maybe the Jago family who ended up in my house two or three generations later were neighbours of my StSbyS/Maker people and related to Hemmum's. 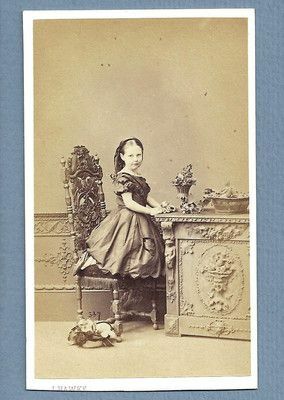 "1900s Old CDV Real Photo Beautiful Victorian Girl Photographer Jno Hawke Devon | ebay"
I don't know whether that might help to date Capt Bob. Not a lot, I think. However, I do think, from the mutton chops, that the date of the photo is more likely to be earlier in the 1800s, like the 1860s. And I would guess that Jonathan is an overreading of "Jno" and he was more likely just John. And another photo at ebay dated as 1875. Of course I have to say also: Absolutely follow the girls! Sorry, DSW, I didn't twig to that when I read your previous post. I'm not related to any Jefferys; I was just trying to help out, and five years later now, I have no recollection of what I was up to! Hi Bugbear, it's a little too bad you went with Ancestry, in my humble opinion. For US$30 (if I recall correctly) you can upload the results to Family Tree DNA once you have them, to try for matches there. What I was originally suggesting was YDNA testing, the one that is used to trace a male line. That is not done by Ancestry. You mentioned that you might be able to find a male-line descendant in your husband's family, so I would still consider that -- since there is a male-line descendant of William Skinner Bice c1790 in the Cornwall YDNA project at FTDNA. I would strongly suspect that the various Bices in Cornwall are all related, and YDNA tests can show connection with a common male ancestor pretty far back. Autosomal testing will not identify cousinships beyond 5th cousin (i.e. same grx4 grandparent), really, and may not do so reliably that far back. Otherwise, you might see whether the Bice descendant at FTDNA has done (or would do) an autosomal test of the same kind as Anc'y's (called Family Finder at FTDNA), so that you could upload and compare, or would test at Ancestry himself. So ... another question going back to the beginning. You've identified this couple as your ancestors - how? Baptisms at that time did not ordinarily give the mother's previous surname. Your ancestor was a child of a William Bennett & Elizabeth? and baptised after 1747 in Stoke Damerel, presumably.